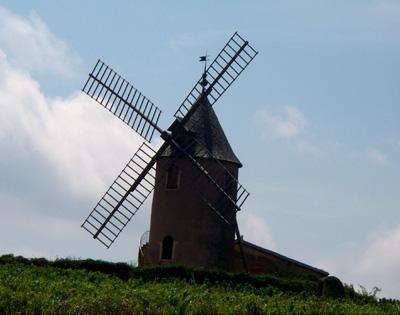 Jean-Paul Brun produces traditional Beaujolais wines at the Domaine des Terres Dorées which is located close to the village of Charnay some 40 miles to the north of Lyons in the southern part of the Beaujolais AOC region. Taking over his father's mixed farm which included just four hectares of Gamay planted vineyards in the area known as ‘La Region des Pierres Dorées’ (the region of the golden stones) locally in 1979 his growing enthusiasm for winemaking has resulted in him expanding his vineyard holdings to more than thirty hectares today and he now owns parcels not only in Beaujolias but also in the Beaujolais Crus districts of Morgon, Côte de Brouilly, Moulin à Vent and Fleurie. Jean-Paul has found himself swimming against the tide of modern Beaujolais AOC regulations as his stubborn resistance to the fashion for using whole-berry carbonic maceration, industrially produced yeasts from the Netherlands which make all of the wines taste very similar with aromas of banana and bubblegum as well as the indiscriminate addition of sugar (chaptalisation) to make the wines higher in alcohol has often had the regional authorities on his back claiming that his wines fail to display typicity. In fact his insistence in producing Beaujolais Rouge which is light and fruity, lower in alcohol than the almost standard 13% whilst being allowed to faithfully express its terroir by virtue of its natural yeast fermentation methods led the wine bureaucracy in Beaujolais to declassify two thirds of the 2007 vintage for the crime of being "atypical". As a result Jean-Paul was forced to sell it off as vin de table (table wine) before it was awarded a score of 90 points from wine guru and leading critic Robert Parker's Wine Advocate stating that Jean-Pauls wines are enjoyed by purists. Jean-Paul Brun's vineyards of The Domaine des Terres Dorées can be classified into two main soil and sub-soil types. The holdings within the AOC Beaujolais area consist mostly of clay over calcareous limestone, some granite and a small amount of iron. Here he grows Gamay and also around three hectares of Chardonnay vines planted in the early 1990s, a significant parcel and very much counter to recent trends, to make a rare Beaujolais Blanc. A little more than twenty years ago he also planted some Pinot Noir vines which are now producing some very nice silky wines full of cherry and other red fruit aromas. Further to the north his vineyard plots in the so-called cru villages are planted exclusively with Gamay vines which make altogether sturdier wines from warmer, largely sand-covered, granite-based soils with excellent drainage that allows the grapes to fully ripen and which typically show greater concentration in their juice. Viticultural techniques are organic, sustainable, "culture raisonee" although certification has not been pursued as this can prove to be exceptionally restrictive in terms of dealing with vintage variability. 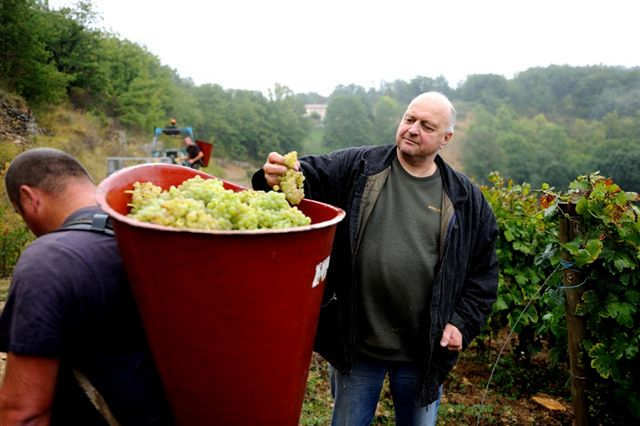 As outlined above Jean-Paul Brun uses traditional winemaking techniques that produce wines with character. Many commentators have likened his method of making his Beaujolais Rouge to those of Burgundy to the north (vinification Bourguignon). Eschewing carbonic maceration he prefers first to select bunches before de-stemming the grapes. He employs the practice of "pigeage" or the treading of the grapes in vats before the juice is allowed to macerate on the skins for anything between four and six weeks. Fermentation is naturally initiated using only the indigenous yeasts and any chaptalisation deemed necessary is carried out with a very light hand. Heating of the must (thermo-vinification), although widely used in the region, is frowned upon at this domaine. The character of the particular vintage will determine whether maturation takes place in cement vats or in oak barriques. When the time comes for bottling, anything between eighteen and twenty four months following the harvest, as little sulphite as possible is used with a little carbon-dioxide being the preferred method of preserving the wine. For his Beaujolais Blanc the vinification is all natural and takes place in stainless steel tanks. The Classic bottling is aged (élevé) on its lees but rather than use a vertical tank a horizontal one is used to bring more of the wine in close contact with the lees to impart some extra richness. Another bottling (En Fûts) is matured in oak barriques for an altogether more complex wine which has been compared favourably with that of Meursault. Terres Dorées AOC Beaujolais Cuvée Première - made from vines that are approximately twenty years old. Terres Dorées AOC Beaujolais l'Ancien - an elegant, traditional wine with very good structure made from older vines. Small bunches of concentrated grapes are naturally fermented to make a fruity, classic Beaujolais. Terres Dorées AOC Beaujolais l'Ancien Le Buissy - made from the fruit of almost eighty year old vines and aged in five year old barriques. Typically raspberry and cherry fruit with a savoury undertone. Terres Dorées AOC Côte de Brouilly - harvested from two separate plots of Gamay vines totalling four hectares on blue granite scree, three hundred meters above sea level, that are both about fifty years old. Dark berry fruit is typical matched by fantastic minerality and a racy acidity. Terres Dorées AOC Morgon - often considered the best of the cru villages this Morgon is made from grapes sourced in the south of the appellation from an elevated section of the Grand Cras parcel with a volcanic sediment. Strawberry and cherry fruit, minerality, spice and acidicty are typical hallmarks of this wine. Terres Dorées AOC Moulin à Vent - This wine is typified by flavours of bitter cherry, cassis and even violet pastilles, savoury notes and a long, spicy finish. Terres Dorées AOC Fleurie - with more complexity and power than the average Fleurie wine. Terres Dorées AOC Fleurie Grille Midi - "Grille Midi" is generally acknowledged to be the best "climat" in the Fleurie appellation, worthy of a separate vinification and bottling. Terres Dorées AOC Beaujolais Rosé d'Folie - an AOC Beaujolais made from Gamay, this rosé is fresh, pinky-orange wine reminiscent of raspberries. Terres Dorées AOC Beaujolais Blanc Classic - naturally vinified with no oak at all. A fresh Chardonnay from limestone soils showing apple, melon, pineapple and lemon with a distinct salinity that reminds some tasters of a reduction made from the shells of crustacea. Jean-Paul also produces an oak aged Roussanne which is made from a variety proscribed within the Beaujolais appellation and is therefore a designated a vin de Pays. 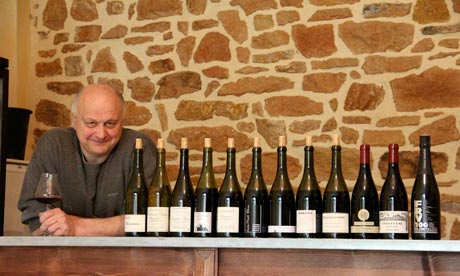 His acclaimed Pinot Noir, sold in Michelin star restaurants throughout France is a generic AOC Bourgogne. A sparkling Crémant de Bourgogne is produced from Chardonnay, a lower alcohol lightly sparkling rosé is made from Gamay grapes is named FRV 100 (which sounds like "effervescent" in French!) and he also buys in some grapes from the northern Rhône to produce a Côte-Rôtie as well as a Condrieu from Viognier grapes. 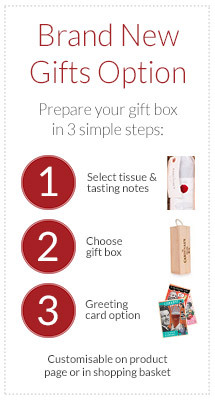 The last two are made in very small quantities and are very difficult to source.